Fed up with their nation's corrupt, mendacious, ineffectual leadership, a group of Americans is seeking to join the Russian Federation. "We are collecting signatures for a national referendum on whether to remain a failed state - an economic basket case run by criminal oligarchs - or to join the Russian Federation under a President with a proven track record of bringing oligarchs to heel," said Bill Blatsky, head of the Join Russia - Putin for President committee. Referendum proponents point out that the US has deep historic ties with Russia. "Nearly 20% of the United States consists of Alaska, which was historically Russian territory," Blatsky explains. "Even today, Sarah Palin can look out her window across the Bering Strait, see the glittering lights of Vladivostok, and sigh longingly, wishing she were over there in a civilized country, where an ignorant hick like her wouldn't stand a chance of getting elected dogcatcher. Why would Americans wish to remain in a nation that would even contemplate putting such a person within a heartbeat of its presidency? By joining the Russian Federation, we would become part of a country with at least a semblance of an educational system." The Putin for President movement points out that America's West Coast from San Francisco northward - the coolest part of the USA - is also arguably a historic part of Russia. "It isn't just Alaska," Blatsky explained. "There is a reason that the world's leading marijuana producer, Humboldt County, California, is named after the Russian explorer and marijuana connoisseur Alexander Von Humboldt, who planted the Russian flag on these shores but forgot about it due to short-term memory dysfunction. Unfortunately, I can't remember what that reason is. And let's not forget that Bohemian Grove, where America's criminal oligarchs meet annually to plot their plunder, is on the Russian River. Wouldn't it be great if Putin sent a battleship up that river and arrested all those guys?" 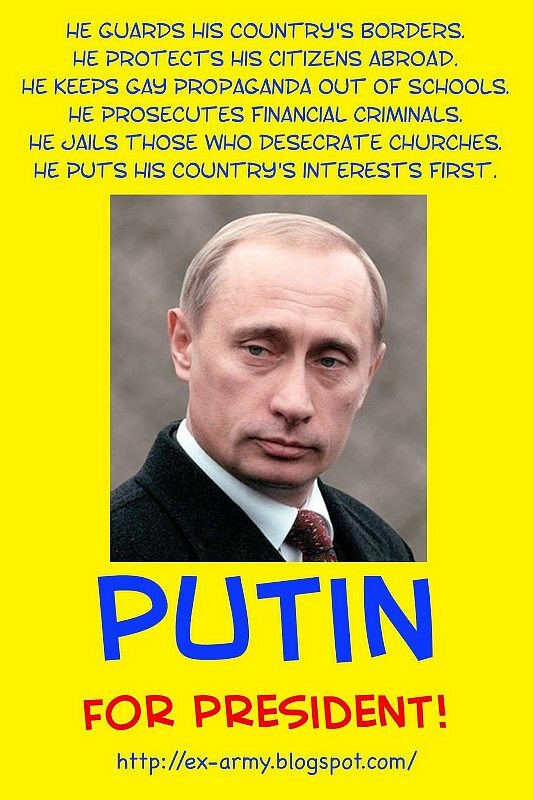 If the Join-Russia Referendum fails to make the national ballot, supporters have a fall-back option: Running Vladimir Putin as a candidate for the Presidency of the United States of America. Blatsky likes Putin's chances: "If Putin ran against the six most recent major party candidates for President - Barrack Obama, Mitt Romney, John McCain, John Kerry, Al Gore, and George W. Bush - he would win more votes than all the other candidates combined." Supporters of the Russian and would-be American president are already printing millions of bumperstickers reading: "Putin for President: At Least He's Competent."